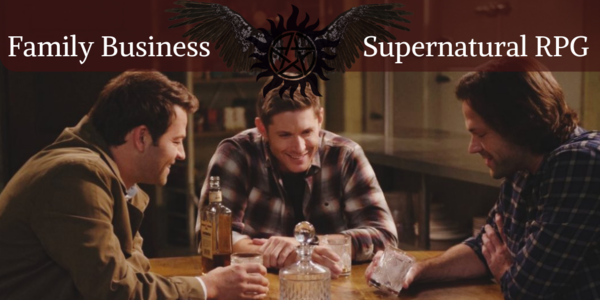 Family Business (@FamilyB_RPG) is a Supernatural Role Play group on Twitter. They stay as close to canon as they can, whilst still creating their own storylines, spreading kindness, and interacting with the SPNFamily. In April 2018, the Twitter account @DWImpalaOwner was created. They started to tweet as Dean Winchester back when he was stuck in the Apocalypse world with Ketch, just before the episode 13.18 Bring 'em Back Alive took place, and has continued to tweet along with the show ever since. For the first couple of months, the group only consisted of Dean. Dean would interact with the Supernatural fandom as Dean Winchester, and would do storylines in between episodes of the show. There weren’t any other characters for him to interact with, but despite this, he would still reference other characters and their actions, including Sam Winchester and Castiel. In June 2018, a few more accounts joined the group, including a Jack Kline, (@IAmCalledJack), a Sam Winchester (@ItsSam1983), and a Charlie Bradbury (@BrightestGeek). After that, more members were added, and the group began to form into what it is today. In October 2018, the admins decided to create a Twitter account for the group, and chose the name “Family Business.” They felt like this name was fitting because family is one of the main themes of the show. The group’s members and rules listed on their group Twitter account, and some of the group’s past storylines are listed in the Moments section as well. They chose to put their storylines together so that their followers, and any new followers, could access them easily and read them. Their storylines range from being emotional to being funny, while try to fit in with what is happening on the show. The group tries its best to stick to what is happening on the show. They will move a bit away from canon during long hiatuses, such as the summer hiatus and the Christmas hiatus, but will always find a way to set things back to canon before the show returns. Additionally, they try to add characters who are alive on the show, but if a character is added then gets killed in a future episode, the admin will be given the choice to either play a different character or to play that character in Heaven. However, due to the group sticking to canon, that character won’t be revived until they come back on the show. They also Role Play as if the characters themselves have a Twitter account, and they tell their followers that they are from a different universe to allow the SPNFamily to interact without any confusion. The group aims to create storylines with the characters we love, whilst spreading kindness and fun for everyone.